These are mainly Society events. For a full list of events locally please go to the Highclere Village Website (e.g. Village Hall events, Highclere Film Club and so on). Scroll down this page for information on 'Walking for Health' weekly walks in December and January. Thurs 7th Highclere Film Club 7.30pm for 8pm. Village Hall. The Little Stranger. The story of a country doctor and how his family's story is intertwined with that of the Ayres family of Hundreds Hall. Stars Charlotte Rampling, Ruth Wilson and Will Poulter. Thurs 21st Highclere Film Club 7.30pm for 8pm. Village Hall. Some Like It Hot. Often cited as the funniest film ever, this tells the tale of two musicians (Jack Lemmon and Tony Curtis), who witness the St Valentine's Day massacre in Chicago and flee to Florida as members of an all-female band. Sun 23rd Annual Summer Barbecue A date for your diary. More details nearer the time. Rampant Cat - March 8th and 22nd. Walks last around 60 minutes at a steady, medium pace. Please dress for the weather with footwear suitable for footpaths. Slower walkers get a shorter walk at an easier pace. First-timers please arrive around 10.20am to register. Sun 29th Jun: The Society's annual barbecue. Held at The Shielings - read report. Tue 3rd Jun: Highclere Parish Assembly - held in the Dunlop Room, Highclere Church. 2nd - 5th June: "Flowers of the Crown" - the village's fantastic and highly acclaimed flower festival in the church. Sun 27th May: "One World", a world tour in music and prose by Watership Cantabile. Proceeds to Living Paintings, our charity of the year - see report and About Living Paintings by Christine Leah (PDF). Thur 2nd February: 'Call My Bluff' Wine Quiz - read report. 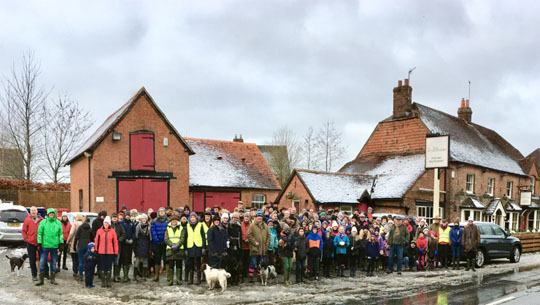 Tues 27th December: Annual Village Christmas Walk in aid of Jacks Place - read report. Thur 24th November: The Society's AGM. News of a new AED and support for charities - read report. Sat 12th November: 'Broadway themed' evening Party to celebrate the Society's 15th birthday - read report. Thur 29th September: Society golf day at Sherfield Oaks, Basingstoke - read report. Mon 4th April: Society golf day at Weybrook Golf Club, Basingstoke - read report. Thurs 17th February: A wine quiz in the village hall. Great fun was had by all in trying to "spot the wine" - read report. Monday 27th December: The Annual Village Christmas Walk. A circular walk from the Red House - read report. Thursday 18th November: AGM with donation to Help The Heros and a talk on sustainable homes - see photo. Monday 8th November: Society Golf Day at Goring & Streatley - read report. Sunday 20th June: The Society's annual summer social event: this year a hogroast - read report. Monday 12th April: Highclere Society Golf Day at Ogbourne Downs - read report. Saturday 27th Feb: Ceilidh and Barn Dance Band - a sell out! Sunday 27th December: 25th Annual Charity Walk. Over 300 attended. Read report and see photo. Thursday 12th November: The Society's AGM, with crime becoming a heightened concern. Read report. Monday 5th Oct: Golf day at The Hampshire just outside Andover. Read report. Sunday 28th June: Hog Roast. The usual format with a 'gazebo village' to protect us from the sun! Read report.